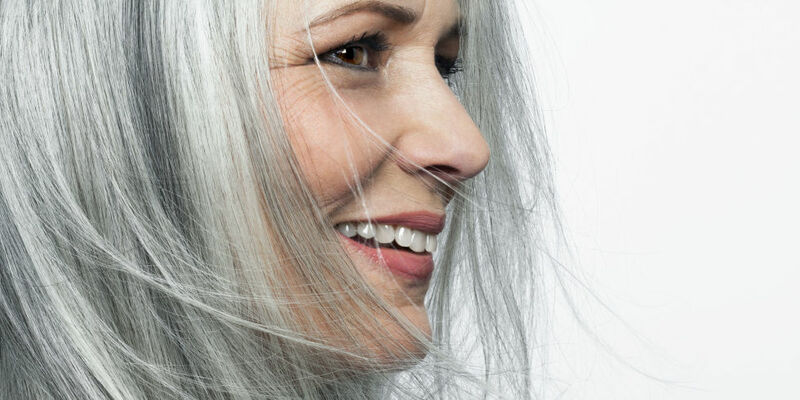 There are a few reason as to why our hair turns gray, silver, or even white. But, first and foremost, this process ultimately occurs when the chemical, melanin, is no longer being produced in the hair follicles. This chemical is responsible for providing each hair strand it’s unique color. Because melanin also provides moisture, the hair may become more brittle and be less bouncy when the chemical is not being produced as much. As we age, our bodies slowly stop producing melanin. And you will often see that individual hairs will begin to gray because melanin is produced for each individual hair strand. Many say that stress is a huge factor in causing premature grays. Mental, physical, and emotional stresses such as; head trauma, deficiencies in your nutrition, and surgeries are highly likely to cause premature graying. Although stress can cause premature depigmentation, normally stress will cause hair loss instead. Smoking, especially in people under the age of 30, has been linked to premature graying. Sometimes an autoimmune such as a thyroid disorder or a genetic condition such as vitiligo, may to be to blame for those gray sparkles. If someone is susceptible to gray hair, the stress will unfortunately cause the gray hair to appear sooner. Most people experience the onset of grays in the front hairline, and usually around the temples. And, over time, will continue it’s way towards the back of the head. Sometimes a “first gray” can be a fluke, and be a spontaneous gray where it grows back with your normal hair color. Many scientists, however, believe that genetics and age are most likely the biggest issues of gray hair. Even though, there has yet to be a definitive reason as to why the melanin isn’t being produced. Maintaining a healthy and balanced diet may aid in keeping your color strong. On average, most males by age 30, and females by age 35 will start experiencing gray hairs, or “natural sparkles” as I like to call them! If you are a male and gray, you may be lucky enough to be referred to as “distinguished” or a “silver fox”, but many women are not so fortunate. Unfortunately, there is no real for sure way to retard the process of the onset of grays. However, to camouflage them, you can always go the haircolor route, which has many options depending upon your lifestyle and what you’re looking to accomplish. For those of you that pluck your grays, and have been told that more grays will grow back in the same spot, this is not true. One is unable to produce multiple hairs by doing so. However, I would advise you to refrain from over plucking any of those areas, as you may not get any regrowth at all eventually and damaging the hair follicles. There is belief that there will eventually be a cure for gray hair. Until then, I believe having access to hair color is a great alternative or temporary fix. Be prepared for your grays to be a little more stubborn or resistant to hair color as it is technically colorless.